Mens 1 Row Tennis Real Diamond Toni Set 10k Yellow Gold Bracelet 7 1/2ct 8"
Total # Of Stones: 92 Cut: Round. Color: Blue Clarity: SI1. Truly beautiful 2.46ct diamond tennis bracelet in 18ct white gold. Length 7"(18cm). Total diamond weight 2.46ct (bracelet stamped). Colour G/H and Clarity Si1 - I1. Forever beaming with fabulous fire and life this bracelet will not disappoint! 18ct Yellow Gold 750. Tennis Bracelet. Diamond Colour & Clarity Diamond Shape Total Diamond Weight Round Brilliant Cut. Type of Piece 2.71ct (50 x 2.5mm RB cuts). 14ct 14k Gold diamond .and emerald bracelet NOT 18ct or 9ct.Fully marked. Hallmarked By : Assay Office London. Round & Pear Diamond Tennis Bracelet. Diamond Shape : Round Brilliant & Pear. Setting Type : Claw Setting. This bracelet is also available in 9k, 18k ,White Gold, Yellow Gold, Rose Gold & 950 Platinum with diamond clarity SI, VS, VVS. BEAUTIFUL VINTAGE DIAMOND BRACELET with deep blue sapphires this is gorgeous. Material: 14ct White Gold. This is a Beautiful New 14k White Gold and Diamond Tennis Bracelet set with a total of 14 sparkling diamonds weighing 0.50cts in total. This delicate bracelet has a tongue and groove clasp and a safety lock. A Stunning Hallmarked 18ct White Gold Diamond Tennis Bracelet. The Bracelet is fully hallmarked for 18ct Gold to the catch (see photo's). The Bracelet has an excellent design having white gold links set with 39 genuine round brilliant cut diamonds (Clarity SI1 Colour J) set in the semi rigid interlocking links and having approx 2.0 carat and having an excellent catch with safety catch (see photo's). Stunning white gold diamond tennis bracelet. 18ct White gold Tennis Bracelet holding 248baguette and round Diamonds, U.K hallmark total gold weight 25.8 grams total diamond carat 7.35. Condition is New. About the product: This item is a Diamond Tennis bracelet, traditionally a ladies piece, it’s elegant, dainty design is classically considered to be classy and feminine. White gold is considered by many to be modern (as precious jewellery goes), having overtaken the more traditional yellow gold in popularity. (18CT HALLMARKED WHITE GOLD 7.5" TENNIS BRACELET. MINIMUM OF 1.00 CT OF G COLOUR, SI1 CLARITY. DIAMOND CLARITY: SI1. EVERY WOMAN'S DREAM. A 1.00 CARAT DIAMOND BRACELET. BUT THIS BRACELET IS AS SMOOTH AS A RUBOVER SETTING). 18ct YELLOW GOLD. 2.50ct diamonds GSI- ROUND DIAMONDS. 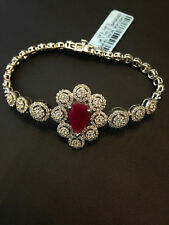 POPULAR TENNIS BRACELET. sent in box. Circles diamonds tennis bracelet. Clarity SI1. Country of Manufacture United States. Country/Region of Manufacture United States. Total Carat Weight (TCW). 70. Diamond Color H. Cut Very Good. Style Tennis. 18ct White Gold Tennis Bracelet. solid 18ct white gold links. This is a most decadent and feminine piece of jewellery that looks. Round brilliant cut diamonds possess great fire and brilliance. They are cut to a precise formula, to achieve the maximum possible degree of vibrant sparkle from the gem. This truly radiant 18ct yellow gold diamond bracelet is simply irresistible. Ruby & Rose, 7 Gammon Walk, Barnstaple, North Devon, EX31 1DJ. Fully hallmarked and diamond content stamp. Resizing & Repairs. 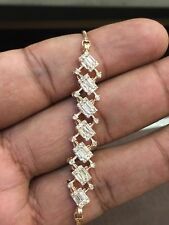 Hallmarked 14ct 14k Gold Genuine Natural 0.82cts Diamond Tennis Link Bracelet 7"
This bracelet is Hallmarked as 14ct (585) Gold and the diamond weight is engraved at the back of the clasp. The other details are as follows-. Hallmark: Hallmarked as 14ct Gold (585). Material: 14ct Yellow Gold. 14ct White Gold 4.00cts Diamond Line Tennis Bracelet B112. 18ct White Solid Gold Diamond Tennis / Line Bracelet - 2.00ct - 7 ½"
Since 1978, we have proudly provided the highest quality jewellery that epitomises class and style. Loved by all customers, this product is made using the most advanced techniques and expert craftsmanship. This product is fully compliant with the hallmarking regulations and has undergone strict quality control tests to guarantee durability and quality. Orders received before 2pm are posted the same business day. Each item is quality checked & supplied in a gift pouch. We guarantee all workmanship for 3 months. Every effort is taken to ensure the accuracy of this listing. Please note that the quoted weights may differ by /- 0.5g. This is completely normal and is due to small variations in the manufacturing process. normal and is due to small variations in the manufacturing process. .
AS THE CENTRE OF LONDON'S DIAMOND TRADE. DIAMOND CLARITY: SI1. DIAMOND COLOUR: G/H. 120 ROUND BRILLIANT CUT SPARKLING DIAMONDS. HOWEVER, WE HAVE MADE AN EXCEPTION TO ALLOW YOU TO INSPECT THE EARRINGS PRIOR TO DECIDING TO KEEP THEM. Hallmarked: 18ct Gold London 2019. Era/Dated: Modern. If you have a Google account just enter M G Welch Jewellers for the link. Weight: 25.8 grams. Length 7" (180mm). ❤️Perfect Christmas gift ❤️, Diamond Bracelet 8.38 Carats. About the product: This item is a Diamond Tennis bracelet, traditionally a ladies piece, it’s elegant, dainty design is widely considered to be classy and feminine. A GIA certified 4 carat diamond tennis bracelet.The stones are G/H colours and Sl1 (small inclusion). This bracelet is Hallmarked as 14ct (585) Gold and the diamond weight is engraved on the side of the clasp. The other details are as follows-. Material: 14ct Yellow Gold. Hallmark: Hallmarked as 14ct Gold (585). This stunning diamond bracelet weighs a total of 18.5gms. It features an approximate total of 10ct of diamonds. These consist of 36 round brilliant cut stones in H colour and VS/SI quality. The bracelet is made from 14ct white gold and features a push clasp with safety latch. Welcome to Jewelco London and thank you for visiting! Jewelco London Conflict Free, Ladies Solid 9ct White Gold Pave Set Round H SI 0.42ct Diamond Fancy 9mm Tennis Bracelet.This stunning diamond bracelet will look amazing on your loved one's wrist. The solid 9ct white gold piece features fine diamonds carefully set into alternate hearts. The bracelet is fitted with a snap style clasp for additional security and will add a touch if timeless luxury to any outfit. Approximate Length : 191mm . New listing14k Yellow Gold Rope X style Diamond Tennis Bracelet 7 "
This fine bracelet features genuine diamonds with total weight of 0.25 carat. Style Tennis. Diamond Color H. Secondary Stone Diamond. Country/Region of Manufacture United States. Main Stone Diamond. 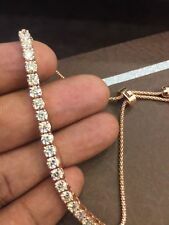 14kt yellow gold diamond tennis bracelet, there are "s'" bars rounded in between 36 diamonds which total 8cts. of top brown SI1-SI2 quality diamonds. The bracelet weighs 22.2 grams and is 7" long. Style Tennis. When ordering from the US, parcels may be subject to import tax and duty charges, which the buyer is responsible to pay. THIS IS A GUARANTEED BARGAIN DEAL OR MONEY BACK!!!! DIAMOND FASHION TENNIS BRACELET Unique jewelry piece, absolutely an eye catcher! Here's a classic diamond bracelet that holds 2.0 carats of princess cut natural diamonds, H-I color SI-1 clarity 20 bars, 2 Rows of princess cut diamonds It measures 7 inches, 3.7 mm wide This will perfectly fit a SMALL - LARGE wrist "light and fancy" Hand made setting, set under microscope Mounted and Hallmarked 14kt solid white gold that weighs 12.5 grams It comes with a bracelet box ESTIMATED RETAIL PRICE: $3,200 SKU: 13931 Buy with confidence from a bonafide jeweler! We strive to offer competitive prices so you can be confident with your purchase. Welcome to Jewelco London and thank you for visiting! Jewelco London Conflict Free, Ladies Solid 18ct White Gold Rub Over Set Round G SI1 1ct Diamond Line 2.6mm Tennis Bracelet.Experience the luxury of this exquisite diamond tennis bracelet, featuring sensational Round brilliant-cut fine diamonds beautifully showcased in a traditional 18ct white gold rub-over set bracelet. A contemporary classic transcending generations. Approximate Length : 7 inch . The box style links are prong set with forty-two (42) natural, genuine, untreated, full cut, fully faceted, round brilliant diamonds of fancy light champagne color and SI1 to SI2 clarity totaling 2.70CTS. 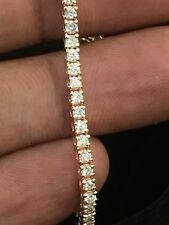 10k , 10ct yellow Gold heavy 43.5 gram diamond bracelet. Dispatched with Royal Mail special delivery insured. Hallmarked By Assay Office London. Diamond Cut : Very Good Hallmarked By : Assay Office London. Diamond Shape : Round & Pear Setting Type : Claw Setting. This bracelet is also available in 9k, 18k ,White Gold, Yellow Gold, Rose Gold & 950 Platinum with diamond clarity SI, VS, VVS. THIS IS A GUARANTEED BARGAIN DEAL OR MONEY BACK!!!! 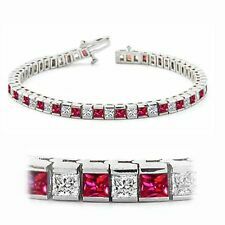 DIAMOND FASHION SLIM TENNIS BRACELET Unique jewelry piece, absolutely an eye catcher! Here's a classic diamond bracelet that holds .75 carats of round brilliants cut natural diamonds, I color SI-1 clarity SLIM TENNIS BRACELET It measures 7 inches, 3.1 mm wide This will perfectly fit a SMALL - LARGE wrist "light and fancy" Hand made setting, set under microscope Mounted and Hallmarked 14kt solid white gold that weighs 8.3 grams It comes with a bracelet box ESTIMATED RETAIL PRICE: $1,900 SKU: 12014 Buy with confidence, Buy with a bonafide jeweler! Our items are brand new, not re-polished!!!! 100% NEW!! !Think about our offer and realize how much money you can save with VERACCI JEWELS. CHECK OUT DAILY ON OUR NEW POSTED ITEMS. VERACCI JEWELS has been in the market for almost 48years. Welcome to Jewelco London and thank you for visiting! Jewelco London Conflict Free, Ladies Solid 18ct Yellow Gold 4 Claw Set Round G SI1 3ct Diamond Line 2mm Tennis Bracelet.Be glamorous and experience the luxury of this chic and exquisite Tennis bracelet. Featuring stunning Round brilliant-cut fine diamonds, four claw set in a traditional 18ct gold bracelet. A contemporary classic transcending generations. Approximate Length : 191mm . Stones: < span class = "notranslate" > Diamonds < span class = "notranslate" > : < span class = notranslate ' > < span class = notranslate ' > 0 2.0 CT < span class = "notranslate" > < span class = "notranslate" > purity < span class = "notranslate" > < span class = "notranslate" > color: G.
You are looking at a gorgeous 14 k yellow & white gold xo diamond bracelet. Total Carat Weight (TCW) 0.40. Diamond Color H I.
Hallmarked by London Assay Office. Hallmarked : London Assay Office. A Classic & Elegant Diamond Set Tennis Bracelet made in 18K White Gold in 4-Claw Setting. Diamond Weight - 1.00 carats. Diamond Colour - GH.